Whisky is not self-evident. It has a certain seductive mystique that is central to its allure. The pursuit of whisky – like that of all worthwhile endeavours – requires measures of application, perseverance and patience, efforts that are amply rewarding (and rewarded). As one embarks on this path perhaps the most pressing query is that of how to drink whisky. This question has been repeatedly put to me (as a whisky lover), and it should be answered very seriously. 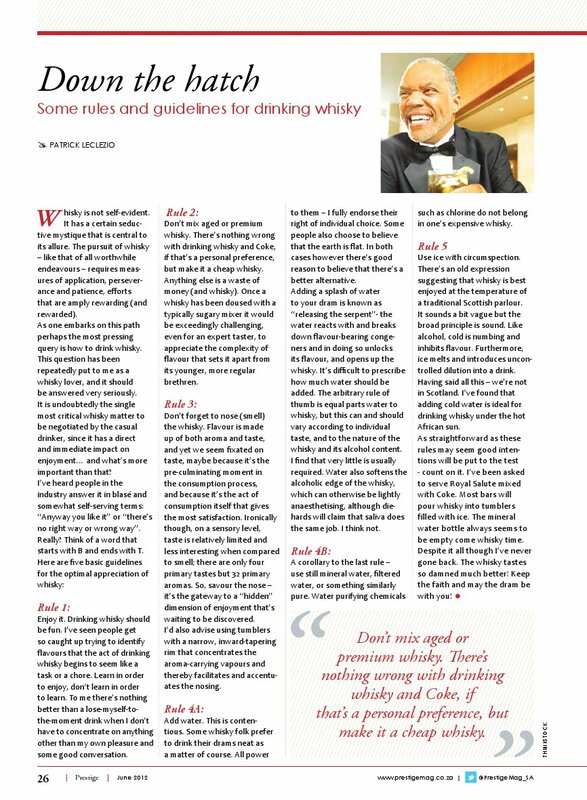 It is undoubtedly the single most critical whisky matter to be encountered by the casual drinker, since it has a direct and immediate impact on enjoyment…and what’s more important than that. I’ve heard people in the industry answer it in blasé and somewhat self-serving terms: “Anyway you like it” or “there’s no right way or wrong way”. Really? Think of a word that starts with B and ends with T. Here are five basic guidelines for the optimal appreciation of whisky. Enjoy it. Drinking whisky should be fun. I’ve seen people get so caught up trying to identify flavours that the act of drinking whisky begins to seem like a task or a chore. Learn in order to enjoy, don’t learn just for the sake of learning. To me there’s nothing better than a lose-myself-to-the-moment drink when I don’t have to concentrate on anything other than my own pleasure and some good conversation. Don’t mix aged or premium whisky. There’s nothing wrong with drinking whisky and Coke, if that’s a personal preference, but make a cheap whisky. Anything else is a waste of money (and whisky). Once a whisky has been doused with a typically sugary mixer it would be exceedingly challenging, even for an expert taster, to appreciate the complexity of flavour that sets it apart from its younger, more regular brethren. Don’t forget to nose (i.e. smell) the whisky. Flavour is made up of both aroma and taste, and yet we seem fixated on taste, maybe because it’s the pre-culminating moment in the consumption process, and because it’s the act of consumption itself that gives the most satisfaction. Ironically though, on a sensory level, taste is relatively limited and less interesting when compared to smell; there are only four primary tastes but 32 primary aromas. So, savour the nose – it’s the gateway to a “hidden” dimension of enjoyment that’s waiting to be discovered. I’d also advise using tumblers with a narrow, inward-tapering rim that concentrates the aroma-carrying vapours and thereby facilitates and accentuates the nosing. Add water. This is contentious. Some whisky folk prefer to drink their drams neat as a matter of course. All power to them – I fully endorse their right of individual choice. Some people also choose to believe that the earth is flat. In both cases however there’s good reason to believe that there’s a better alternative. Adding a splash of water to your dram is known as “releasing the serpent”- the water reacts with and breaks down flavour-bearing congeners and in doing so unlocks their flavour, and opens up the whisky. It’s difficult to prescribe how much water should be added. The arbitrary rule of thumb is equal parts water to whisky, but this can and should vary according to individual taste, and to the nature of the whisky and its alcohol content. I find that very little is usually required. Water also softens the alcoholic edge of the whisky, which can otherwise be lightly anaesthetising, although die-hards will claim that saliva does the same job. I think not. A corollary to the last rule – use still mineral water, filtered water, or something similarly pure. Water purifying chemicals such as chlorine do not belong in one’s expensive whisky. Use ice with circumspection. There’s an old expression suggesting that whisky is best enjoyed at the temperature of a traditional Scottish parlour. It sounds a bit vague but the broad principle is sound. Like alcohol, cold is numbing and inhibits flavour. Furthermore, ice melts and introduces uncontrolled dilution into a drink. Having said all this – we’re not in Scotland. I’ve found that adding cold water is ideal for drinking whisky under the hot African sun. As straightforward as these rules may seem good intentions will be put to the test – count on it. I’ve been asked to serve Royal Salute mixed with Coke. Most bars will pour whisky into tumblers filled with ice. The mineral water bottle always seems to be empty come whisky time. Despite it all though I’ve never gone back. The whisky tastes so damned much better! Keep the faith and may the dram be with you! This entry was posted in Whisky column and tagged Whiskey, Whisky. Bookmark the permalink. Patrick – I love this post! Especially Rule 1! I think that’s the most important: lean to ENJOY drinking whisky – a good thing to remember especially as more and more whisky enthusiasts turn bloggers pop up – it’s easy to get sucked into the blogosphere & twitter and think that you can’t take a sip of something unless you’re in a quiet room, with the right conditions and a pad of paper for notes. Not me! (possibly apparent by my lack of regular tasting notes posts) 😉 I love sitting back with a good dram, good company & great conversations. Great list. Cheers! Thanks WW – much appreciated. This is also one of the reasons that I’ll never score whisky – the tasting and drinking experience for me is qualitative, not quantitative. I don’t want to feel like a schoolteacher grading papers when I’m kicking back with a dram. LOL! Exactly. I’m totally on board – no grading papers while reviewing a great whisky 🙂 (no offense to those who do – frankly, I’m rather impressed at their dedication & commitment). Just not my personal cup of tea … or 2 finger fill.